How do I install the latest NVIDIA drivers from the .run file? error. Any help would be greatly appreciated. Make sure that no proprietary drivers are installed. If they are, un-activate them - otherwise, they WILL cause problems. The installer will then complain about Nouveau needing to be disabled. It will do so, then you will need to restart your PC. You will then have to redo the above mentioned procedure again to restart the installation. If you have another driver installed, this installer will uninstall it for you. The guide works for 12.04 LTS and 14.04 LTS as well. For the test I took one of the latest Nvidia drivers released by official Nvidia. Download the driver from Nvidia official Source. it'll be named something like nvidia-304.119.run for example. it'll automatically backup your current configuration and create a new config file. Before continuing you can also install dkms on the way. Click Yes (commonly) during installation pop ups and at the end of installation wizard you'll be asked if you want Nvidia to configure and activate driver for you? Click Yes! When logged in do not run sudo nvidia-xconfig as it's already been configured just run gksudo nvidia-settings. The driver works basically on all Nvidia video cards including old ones. Was Xorg already properly configured for the nv driver? Did you disable the loading of Ubuntu provided NVIDIA drivers using DISABLED_MODULES="nv nvidia_new" in /etc/default/linux-restricted-modules-common? This is a common cause of driver mismatch errors on manual installations due to conflicts with the Ubuntu provided NVIDIA binary driver. Did you remove the nvidia-glx/nvidia-glx-legacy/nvidia-glx-new and nvidia-settings packages? Did you read the log found in /var/log/nvidia-installer-log for errors that can guide you? Did you check the output of dmesg ? Did you install the kernel headers (and possibly source package)? Did you check the NVIDIA readme found on their site to make sure your card is supported with that version of driver? Sometimes it might not work, e.g. with Ubuntu 14.04 LTS, currently there are incompatibilities that may occur with newer linux-image kernels to some video cards and after reboot you might be left with a blank screen. How do I make Nvidia driver working after the kernel update in 14.04? When you have manually installed Nvidia driver in 14.04, if the kernel got updated then do not reboot after an update otherwise you will boot to a blank screen. Done. You should login as normal now. In Ubuntu, there's open source driver called Nouveau. 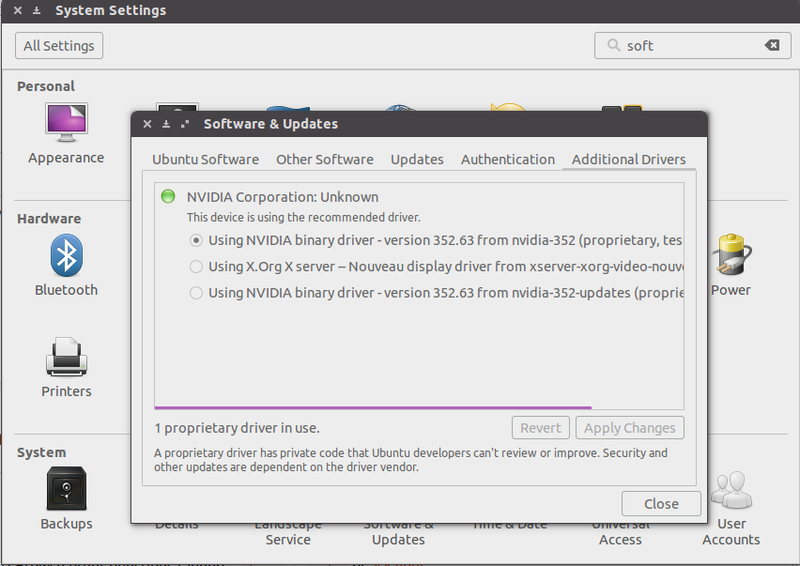 Nouveau makes some troubleshooting in NVIDIA driver installation. Should it to be remove and clean the configuration and comes with NVIDIA driver only for better experiences. This is a first step for beginners to check extra drivers. If after these steps you still do not see your NVIDIA driver you may want to try one of the terminal answers above. how to close x server? How do I install NVIDIA drivers in Ubuntu GNOME 14.10? How do I install the new beta driver for Nvidia? How to fix problem with 555m Nvidia drivers not working on ASUS n55fs? Installing drivers from NVIDIA website for gtx 760? How can I fix 'Unable to load: nvidia-installer ncurses v6 user interface'? How do I install an Nvidia driver in VirtualBox?